Interchangeable cores, or ic, have a figure 8 shape and can be removed from a lock and can be replaced by another core while this one is installed into a whole different lock. **You can order interchangeable cores alone or if you need commercial locks that have interchangeable cores (IC ready locks) we also have those available (just click on the ‘With Interchangeable Core’ under ‘Narrow By Style’ on the left hand side of the commercial locks page I linked you to). What is the Purpose for Interchangeable Cores? Interchangeable cores are commonly used on commercial applications and are readily adapted for master keying, which means several locks can be keyed differently, but have one master key that is able to open all of the locks. Interchangeable cores can be set up with spare cores and keys for an easy and quick replacement just in case there was a problem security wise, such as when a key was lost or stolen – Or just for an example, if employed construction workers were allowed access but have finished their work, it may be a good idea to get some new keys. Extracted cores can be recombinated and placed back into storage for future use. How does an Interchangeable Core Work? Basically you have the figure eight shaped core that you can order with or without the lever/knob lock and with that comes the keys. The most important key that comes with the interchangeable core is the control key, which makes the interchangeable core extract from the lock. Without the control key you will not be able to remove the core from the lock. The control key will not activate your lock, it is only used for removing the core from the lock. Just insert the control key and rotate the key and pull and the entire interchangeable core will come out of the lock with the key. It makes it a really simple and quick way to replace for new locks if needed. You can clearly see that when the deadbolt is in the lock position it will show an “in use” sign in red. When the deadbolt is not being used it will show a green “vacant” sign. This deadbolt also includes and emergency key to be able to unlock the deadbolt from the outside for in case of an emergency. Available in several finishes such as, satin chrome, polished brass, antique brass, oil rubbed bronze, satin nickel, bright chrome and aged bronze. The Schlage’s Restroom Indicator deadbolt is very popular on our site and has great reviews (see below)! This is a great item to use on any restroom door really. I personally think it works best on a door without a locking deadbolt, requiring the user to lock the door to hold the door in place. That way no one will forget to lock the door. But like I said this will work on any commercial restroom door. Ths lock was quite easy to install. It works perfectly and looks great! I am glad to have purchased it. Works beautifully. Does what is it designed to de. Direct Door Hardware was very efficient in the delivery of the deadbolts that I ordered. 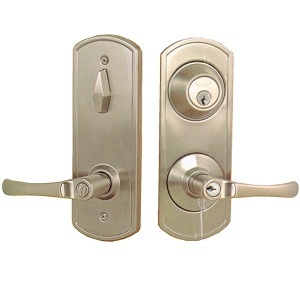 The deadbolts are very high quality and were easy to install. Very nice for the price! PURCHASED THIS ITEM FOR A GYM I RENOVATED. VERY EASY TO INSTALL, REMOVES THE HASSEL OF A STANDARD LOCK. CUSTOMER SERVICE IS OVER AND BEYOND COMPARISON. VERY PLEASED WITH THIS COMPANY AND THE SERVICE RECEIVED. P.S I PURCHASED 2 LOCKS AFTER I FOUND THE FIRST OF SUPERIOR QUALITY. I got looking around Brands and such and thought K2 Commercial Hardware by Stanley hasn’t been talked about yet and this would be a good time to read up on it. Under “About Us” on K2’s site you’ll read their strategy, mission, vision, and why the K2 name and these things are good to know when trying to find a really good brand. K2 Commercial Hardware’s strategy and mission is to be the best out there and easy to do business with. Stanley Black & Decker Hardware & Home Improvement is a leading global provider oif architecturally inspired building products, innovatively designed to improve the places where people live and work. When the BDHHI (Black & Decker Hardware & Home Improvement) commercial hardware team set out to name the new brand, they wanted a name that would mean not only strength and durability, but also beauty. And, of course, the name had to be something that was easily remembered in an already mature marketplace. Finally, it had to pass legal – perhaps the biggest hurdle of all. Competitors were evaluated and their brand names noted. All sorts of names were put on a list and debated. Still, nothing seemed right. The team was tasked with finding even more alternatives. Then one name made the list that seemed right. K2. This was a name that had multiple meanings. Not only is it the name of arguably the toughest mountain in the world to climb – even tougher than Everest by many accounts – it’s a magnificent mountain, rising to a greater vertical height relative to its neighboring summits than Everest. Its beauty is awe-inspiring, its power daunting. But if you are lucky enough to conquer this majestic summit, the exhilaration of being part of K2 is said to be indescribable. K2 stands for everything BDHHI’s commercial brand is about – strength, durability, beauty, rising above, best in class. And the K2 name conveniently fit for another reason as well. Since K2 commercial hardware is part of the Kwikset family, K2 stands for the next generation of Kwikset – one that will become as legendary as the original Kwikset brand. The difference between Commercial and Residential door hardware comes down to grade or quality and better grade means you can pretty much use it more without it breaking on you. You would probably never put a residential door knob (or any other type of hardware for that matter) on a commercial application like a public office building like a dentist’s office for example, a residential door knob wouldn’t last a month – this goes for any type of door hardware, like hinges and any other misc. hardware for doors too. Commercial doors are going to get a lot of use, whether its the bathroom or the front door. And for Residential applications like your home, you don’t need commercial grade hardware for your home a simple 3 grade door knob or residential hinges should do the trick. Unless you have a large family like a customer who called in did and the door knob would keep breaking within a few months and they had to replace it two to three times, in that case maybe you do need a commercial grade door knob. Commercial hardware generally has an ASI grade of 1 or 2, one being the highest and most heavy duty. Commercial hardware not only have heavy duty grades, but also lots of commercial buildings require the hardware to meet certain specifications such as UL Listing, ADA Compliant. You can find all different types of commercial hardware to fit the application you have, check here. 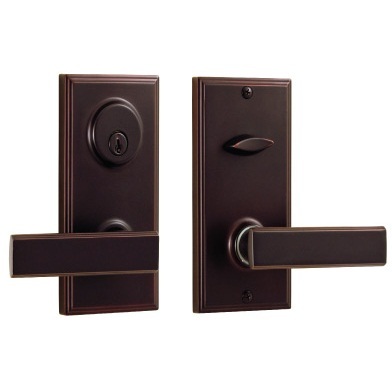 Residential hardware is used for your home. You don’t have a ton of people opening and shutting your door a hundred times a day – well maybe you do (like the man I mentioned earlier) I don’t really know, but nine times out of ten I am sure most homes don’t. Residential hardware is made for doors that don’t get as much wear and tear – if you are using a residential door knob for example on a commercial application and it breaks more than once (which it most likely will) and even though some manufactures have warranties that cover for years or even a lifetime – the warranty may be voided if the hardware is being used on a commercial application rather than residential. So make sure you are using your residential hardware on residential applications if you want your warranty to cover replacements. Interconnect (also known as emergency egress) locks are offered all over the site. Interconnect lock’s interior mechanism, like shown above, makes it possible when turning the knob/lever below will release the lock on the deadbolt above and making it a quick and easy exit. This interconnect device option is only available with the single cylinder, not the double cylinder, as the double cylinder requires a key to unlock from both sides. If you are looking in the handleset section, you want to look for the handlesets that have a full back plate and you can see that the deadbolt and handle are sharing the plate (see image below), all of the Emtek handlesets with the full back plate have an interconnect device option and you will just have to mark the box if you want the feature. There are also Baldwin handlesets with this interconnect feature. 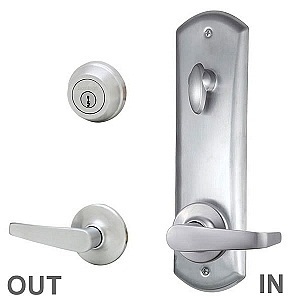 A handleset that has a separate deadbolt from the handle, like shown above on the right, can not include this feature.To make it easier to search for interconnect handlesets, click on the Emergency Egress/Interconnect button under the handle sets category at the top. It will give list all of the handlesets with the interconnect mechanism. You can also find the interconnect feature with some of the sideplates. All of the Emtek 5 1/2″ CC Sideplates have the interconnect device option if you are ordering the single cylinder (not double cylinder) if you choose to select it when ordering. Interconnect devices are not available for the Emtek 3 5/8″ CC sideplates. Looking for commercial grade for with this feature? Under commercial hardware there is a list of categories to the left and you can “narrow by style” by clicking interconnected locks. You can scroll down through all the interconnected locks and find what will work for your application! Now when looking through the commercial interconnect devices after looking for a full plate under the handleset category, you might think that some of these aren’t right because the deadbolt is separated from the lever. It looks that way on the exterior part of the lockset, but all of the commercial interconnect locks have a full plate on the inside of the door and the mechanism works the same. The interconnect locks or emergency egress locks make exiting so much more simple all you need is one hand. It’s a good feature to have for commercial applications especially in case of an emergency. ADA stands for The Americans with Disabilities Act, or a law that was put into practice by the United States Congress in 1990. President George H. W. Bush signed this act into law on July 26, 1990. It’s been a law for a little over two decades, although minor changes were made later and effective January 1, 2009. Basically The Americans with Disabilities Act provide guidelines for a product (in our case, doors and door hardware) to meet requirements and rules to make it safe and easy for people with disabilities. Not all door hardware is ADA compliant; although some hardware may fit every rule they may not have the stamp of ADA approval. Generally ADA compliant hardware is in the commercial hardware section, but there are more residential style brands that meet these requirements like some of Weslock’s Levers for example – you will see the ADA symbol marked on the pages of the hardware. More and more building codes are specifically asking for ADA (American Disabilities Act) compliant products. New laws are being incorporated into building codes to allow people with disabilities, such as people using wheel chairs, scooters, walkers or any other sort of disability that limits mobility, more access as well as travel buildings in a much safer way. Door hardware such as door closers need to meet ADA requirements of strength and size. To be ADA compliant, an interior door can not open with an opening force of more than 5 pounds. 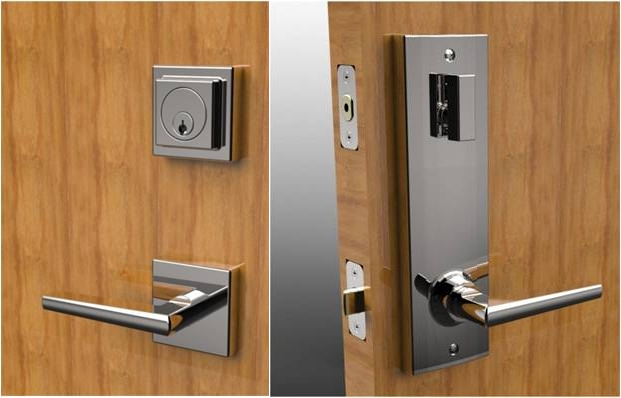 Door Hardware handles, pulls, latches, locks and other operating devices on accessible doors should have a simple shape that is easy to grip with one single hand and it should not require tight grasping twisting of the wrist to operate. Levers must have a push type mechanism, U-shaped handles designs are acceptable. For sliding doors – when the sliding doors are opened fully, the hardware must be exposed and usable from both sides of the sliding door. Hardware for accessible doorways should be mounted no higher than 48 inches from the floor. Entrance doors should be connected by an accessible route to all spaces or elements within the building, and to accessible parking and passenger loading zones, public streets or sidewalks if available. For more guidelines check here.